To Cite: Sobral M C , Machado P L, Barreto M S, Barbosa M C E, Crusoe-Rebello I M . Behavior of Palatal Plane After Rapid Maxillary Expansion Observed Under Cone-Beam Computed Tomography, Iran J Ortho. 2018 ; 13(2):e11015. doi: 10.5812/ijo.11015. Background: Rapid maxillary expansion (RME) is an important method for correcting maxillary transverse deficiency. Objectives: The aim of this study was to assess the variations of the palatal plane in the anteroposterior and vertical directions after RME observed under cone-beam computed tomography. Methods: The images using the cone-beam computed tomography were obtained from the skull of 15 patients (10 males, 5 females) with ages from 7 to 14 years, at the specialization course in orthodontics of the School of Dentistry at UFBA before (T0) and after (T1) RME using the Haas-type expander. The sagittal slices were obtained with Dolphin imaging program, premium version 11.0, in order to visualize the most anterior and posterior extremities of the maxillary bone and the following points: Sella (S), nasion (N), anterior nasal spine (ANS) and posterior nasal spine (PNS). The distances between points S and PNS (L1) and between N and ANS (L2) and the angles formed by the intersection of line SN with the palatal plane (angle 1) and line SN with line N-ANS (angle 2) were measured. Results: The values obtained were statistically analyzed using Students t-test. 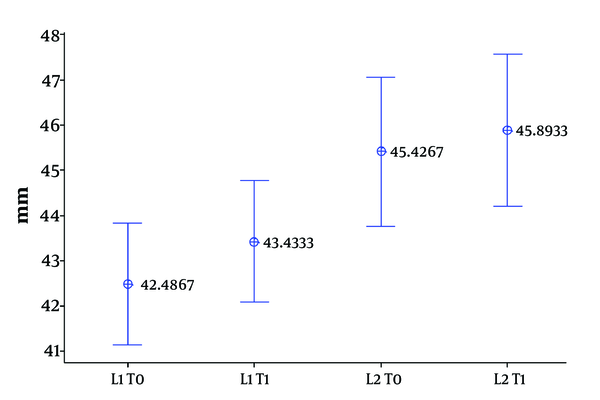 At the time intervals assessed, no statistically significant difference was found in the linear measurements L1 and L2 (P = 0.296 and P = 0.674, respectively). No statistical significance was found when assessing angles 1 and 2 (P = 0.673 and P = 0.589, respectively). Conclusions: RME using the Haas-type expander does not cause any alterations in the vertical or sagittal position of the maxilla. Rapid maxillary expansion (RME) is an important method for correcting maxillary transverse deficiency (1, 2). For this procedure, several types of appliances can be used to open the mid-palatal suture, with intense forces in the transverse direction, causing expansion (1, 3, 4). However, studies using lateral cephalometric radiographs have found that undesirable side effects can occur such as the downward and anterior displacement of the maxilla (5-8). Therefore, these effects may be deleterious for patients with a hyperdivergent pattern causing clockwise rotation of the mandible (6, 8) or leading to anterior open bite in patients who already have this tendency (1, 5, 6, 8, 9). With the advent of cone-beam computed tomography (CBCT), which provides more accurate diagnosis, and the use of computer programs, which allow manipulation of images such as magnification on the screen, three-dimensional assessment of the bone structures and linear and angular measurements, it is possible to obtain more accurate evaluations (10, 11). Thus, the aim of this study was to assess the possible alterations of the maxilla represented by the palatal plane after RME in the anteroposterior and vertical directions through images obtained from the CBCT. This quantitative and longitudinal study was conducted after the approval by the Research Ethics Committee of the School of Dentistry of the Federal University of Bahia (CAAE 10816812.3.0000.5024). CBCT images of patients before and after RME who had sought the Center of Orthodontics and Facial Orthopedics Professor José Édimo Soares Martins (School of Dentistry of the Federal University of Bahia) and who needed to undergo orthodontic treatment were used. Fifteen patients were selected in accordance with the following inclusion criteria: Patients aged between 7 and 14 years who needed rapid maxillary expansion (RME) as part of orthodontic treatment planning; presence of maxillary first molars, maxillary first deciduous molars and/or maxillary first permanent premolars; normal general health condition; agreement with the research and their parents and/or guardians signed a term of free and informed consent (TFIC); have not submitted any previous orthodontic treatment; or no active carious lesions and/or periodontal disease in any teeth. All patients were submitted to a routine clinical examination with the purpose of planning orthodontic treatment and the following complementary exams were performed: Dental casts of the maxillary and mandibular dental arches, intra and extraoral photographs, periapical and interproximal radiographs, and CBCT. These examinations were performed before placing any orthodontic appliances (T0). After RME (T1), a new CBCT was taken since this exam provides other evaluations of alterations that occur in the face, craniofacial sutures, nasal cavity, and in the upper airways. The images were obtained by using the cone-beam computed tomograph iCAT® (Imaging Sciences International, Pennsylvania, USA), in accordance with the following acquisition parameters: FOV (field-of-view) of 22 cm, 120 kVp, 47.74 mAs, voxel of 0.4 mm and acquisition time of 40 seconds. The patients were examined while they were seated with the Frankfort horizontal plane parallel to the ground, mid-sagittal plane perpendicular to the ground and positioned in habitual maximum intercuspation. The images in DICOM (Digital Imaging and Communications in Medicine) format were then imported and multiplanar reconstruction of the maxillary structures was performed using the Dolphin Imaging Program, premium version 11.0 (Dolphin Imaging & Management Solutions, Chatsworth, USA). The RME clinical procedure was performed using the Haas-type expander with the rings placed on the first permanent molars and, depending on the stage of tooth development of the patient, on the first premolars or first deciduous molars. The appliances were fabricated using a 0.036-inch stainless steel wire (Morelli, Sorocaba, São Paulo, Brazil) and a 11 mm expansion screw of the Magnum model (Dentaurum, Ispringen, Baden-Württemberg, Germany), and split acrylic (Jet Articles Dental Classic Ltda, São Paulo, Brazil) that followed the basic design of Haas1. Treatment included an active stage, during which lateral forces were applied, and a passive retainer stage. The first stage lasted from 2 to 4 weeks, depending on the amount of expansion desired, which started 24 hours after the placement of the appliance and the expansion screw was activated twice a day (1/4 turn every 12 hours). At the end of this stage, the screw was stabilized and a new tomographic exam was required. Using the CBCT images obtained from the initial and after expansion, the Dolphin imaging program was used to determine and measure the points. Before performing the markings and measurements of the points, it was necessary to standardize the position of the digital image of the skull according to the coronal and sagittal planes. In the lateral view, the anterior nasal spine (ANS) and posterior nasal spine (PNS) were positioned to coincide with the plane represented by a line parallel to the ground in the program, so it was always necessary to perform the sagittal slices to verify the correct position. In the front view, the midline of the software was positioned exactly on the midline of the patient, coinciding with the nasion (N) and anterior nasal spine (ANS) points. To make sure that the skull was correctly centered, an axial section was made on which the ANS and PNS coincided with the vertical line representing the sagittal plane. This procedure was necessary in order to replicate the 3D-volumetric data set positions in all experimental times (T1 and T2) as well as to evaluate skeletal changes regarding such stable planes. Reference plane positions were recorded to allow the initial position to be resumed whenever necessary. From the sagittal cut in 1 mm thickness of the center of the head, which showed the most anterior and posterior extremities of the maxillary bone, the markers were identified in order to measure the linear distance and angles between them (Figure 1). A single examiner performed all the measurements. In order to avoid possible measurement errors, two similar computers, software and monitors were used side by side, in darkened proper room. This enabled simultaneous manipulation of CBCT images during the location of the planes and landmarks in the experimental times for each patient, with T1 as reference. The following points were established (Figure 1A): Sella point (S), nasion point (N), anterior nasal spine (ANS), and posterior nasal spine (PNS). From these points, linear measurements of the distance between S and PNS (L1) and between N and ANS (L2) were performed (Figure 1B). The angular measurements were obtained by angle 1 formed between the SN line with the palatal plane and by angle 2 formed by the SN line with N-ANS line (Figure 1C). Subsequently these values were treated statistically. To assess the reliability of the method, three initial tomographs and three tomographs after rapid maxillary expansion of three patients were selected, on which the necessary points were marked and proposed measurements were taken. After 15 days, the same procedure was repeated and it was found that all variables showed no statistically significant differences, indicating that the method is reliable and reproducible. After obtaining the assessed values of the 15 patients, the data were tabulated and submitted to statistical analysis and the data of each parameter at time intervals T0 and T1 were compared to assess the possible alterations of the maxilla in the anteroposterior and vertical directions. For this purpose, Student’s t-test was used with 95% confidence interval. Statistical analysis was performed using the Minitab program version 15.0 (Belo Horizonte, Minas Gerais, Brazil). In the vertical direction, from the analysis of the distances between S-PNS (L1) and N-ANS (L2), it was observed that no statistically difference (P = 0.296 and P = 0.674, respectively) with regard to the time intervals evaluated (T0 and T1), as shown in Figure 2. Analyzing also the angle 1, which could determine the rotation of the palatal plane in clockwise or counterclockwise directions, the initial values and after RME did not show any statistically difference (P = 0.673), as shown in Figure 3. 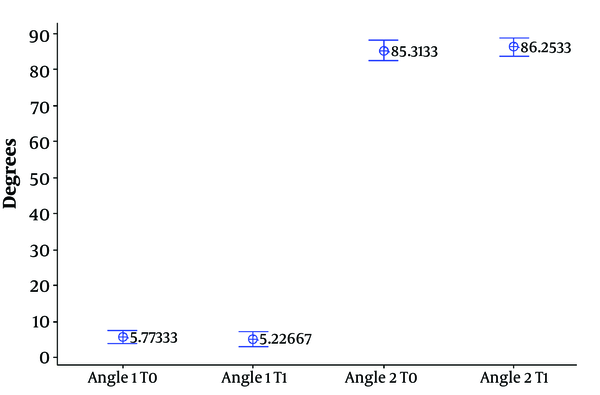 With regard to the behavior of the maxilla in the anteroposterior direction, a similar result was found in the values obtained for angle 2 (Figure 3), since no statistical different was found (P = 0.589). Several evaluations of the behavior of the maxilla after RME were conducted in previous studies, but these studies were limited to evaluating cephalometric radiographs using conventional radiographic images for data acquisition with the disadvantage of superimposition of anatomical structures of the skull. By using CBCT this disadvantage is eliminated, for it allows the distances between anatomical points to be measured and it allows more accurate visualization of the diagnosis parameters resulting in more reliable and precise data (10, 11). 3D assessment of RME outcomes required the choice of stable reference for same registration in each period evaluated. In terms of facial changes, references utilized should not rely on structures that might have changed between the CBCT acquisitions. For this reason, we used points and planes already known in conventional cephalometric, which allowed the standardization of the 3D-reconstruction and the evaluation of the possible alterations of the maxilla in the anteroposterior and vertical directions. That could be one of our study's limitations. The present study used CBCT to assess the behavior of the maxilla, it was observed that in the anteroposterior direction, there was no significant difference. 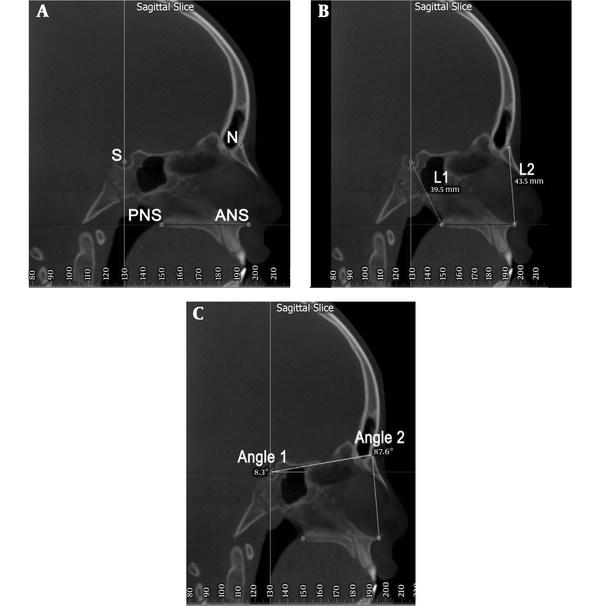 A study of 183 patients using lateral cephalometric radiographs the anterior displacement was not significant in class I and II patients (12), which was in agreement with a study conducted with 25 children that found no alteration in the maxilla in the sagittal direction (13). On the other hand, other authors reported anterior displacement, which favors the correction of skeletal class III malocclusion and anterior crossbite (1, 3, 5). Evaluations performed after the retention period showed values close to the initial ones (1, 14-16), indicating the recurrence of anteroposterior cephalometric alterations. These findings corroborate the results of the present study, despite using different evaluation time intervals, since the analysis of the behavior of the maxilla was performed immediately after RME. It could also be suggested that the use of a more accurate method for obtaining images would minimize the difference in results related to the position of the maxilla at different evaluation times. Short-time tendencies for the development of mandibular/maxillary alterations should not be considered as conclusive results. They should be reassessed after the treatment effect has ceased. Possible orthodontic and orthopedic responses after expansion are subject to recurrences as any movement caused by other types of mechanical (16). Therefore, no difference was found when the growth of children who underwent RME was compared with other children who had not undergone any kind of treatment for a period of 2 years and 9 months after the procedure. This result may suggest that possible undesirable alterations that occur with the use of expanders are compensated by growth and development in the medium and long term and they become insignificant. In the present study, no alterations were observed in the short term, which does not cause concern when secondary effects of RME occur in patients who show normal growth curves. From the analysis of the data, there was no change in the palatal plane in the vertical direction. This result corroborate those of De Rossi et al. (13), but differ from those found by Farronato et al. (12) The two above-mentioned studies, however, used cephalometric radiographs, but these are more difficult to determine posterior nasal spine due to the superimposition of the structures in the image, which prevents more accurate measurements. Another point of divergence is the types of appliances used. Although some studies defend the use of expansion appliances with occlusal coverage for vertical and sagittal control (9, 13), others found no significant changes in the palatal plane with the use of appliances such as the Haas, Hyrax appliances or occlusal coverage (12, 14). In the present research, it was also found that RME performed with the Haas-type appliance did not cause changes in the palatal plane. Positive results were obtained when vertical-pull chincup was used for vertical control in patients with hyperdivergent facial pattern during the active phase of RME up to the end of mixed dentition in comparison with other patients who did not use this accessory appliance (17). Better results were found when the same accessory appliance was used in patients during their pubertal growth spurt (18). This concern becomes pertinent in cases of patients with hyperdivergent skeletal pattern and downward and backward rotation of the mandible, mandibular retrognathism, and anterior open bite. However, these findings are of little statistical relevance and they are clinically insignificant. As the sample of this study was predominantly composed of patients with normal facial patterns and vertical changes were not significant, it can be affirmed that orthopedic appliances specific for vertical control during the active phase of RME become dispensable for individuals with normal growth pattern in order to prevent any adverse effects. In view of the above discussion, further studies using a standardized sample in accordance with the pattern of growth are needed with the purpose of discussing the favorable and unfavorable aspects of RME in patients with hyperdivergent pattern and/or a tendency for development of anterior open-bite. In the present study, the selection of the sample was based on reduced transverse dimension of the maxilla and aspects related to the growth pattern and anteroposterior relationship between maxilla and mandible were not taken into consideration. Therefore, it may be concluded that rapid maxillary expansion using the Haas-type appliance did not significantly change the sagittal and vertical position of the maxilla in patients with normal growth pattern. Authors' Contribution: Study concept and design: Marcio Costa Sobral, Marcelo Castellucci e Barbosa and Ieda Margarida Crusoe-Rebello; analysis and interpretation of data: Pedro Lustosa Machado and Mônica Sena Barreto; drafting of the manuscript: Marcio Costa Sobral, Pedro Lustosa Machado, Mônica Sena Barreto, Marcelo Castellucci e Barbosa and Ieda Margarida Crusoe-Rebello; critical revision of the manuscript for important intellectual content: Marcio Costa Sobral, Pedro Lustosa Machado, Mônica Sena Barreto, Marcelo Castellucci e Barbosa and Ieda Margarida Crusoe-Rebello; statistical analysis: Marcio Costa Sobral, Pedro Lustosa Machado, Marcelo Castellucci e Barbosa and Ieda Margarida Crusoe-Rebello; administrative, technical, and material support: Marcio Costa Sobral, Pedro Lustosa Machado and Mônica Sena Barreto; study supervision: Marcio Costa Sobral, Marcelo Castellucci e Barbosa and Ieda Margarida Crusoe-Rebello. Conflict of Interests: Authors have no financial interests related to the material in the manuscript. Ethical Consideration: This quantitative and longitudinal study was conducted after the approval by the Research Ethics Committee of the School of Dentistry of the Federal University of Bahia (CAAE 10816812.3.0000.5024). Funding/Support: This study was supported by Department of Orthodontics of Federal University of Bahia, Salvador. 1. Haas AJ. Rapid expansion of the maxillary dental arch and nasal cavity by opening the midpalatal suture. Angle Orthod. 1961;31(2):73-90. 2. Wertz R, Dreskin M. Midpalatal suture opening: a normative study. Am J Orthod. 1977;71(4):367-81. doi: 10.1016/0002-9416(77)90241-X. [PubMed: 322499]. 3. Biederman W. A hygienic appliance for rapid expansion. JPO J Pract Orthod. 1968;2(2):67-70. [PubMed: 5241062]. 4. Cohen M, Silverman E. A new and simple palate splitting device. J Clin Orthod. 1973;7(6):368-9. [PubMed: 4575804]. 5. Haas AJ. The treatment of maxillary deficiency by opening the midpalatal suture. Angle Orthod. 1965;35:200-17. doi: 10.1043/0003-3219(1965)035<0200:TTOMDB>2.0.CO;2. [PubMed: 14331020]. 6. Wertz RA. Skeletal and dental changes accompanying rapid midpalatal suture opening. Am J Orthod. 1970;58(1):41-66. doi: 10.1016/0002-9416(70)90127-2. [PubMed: 5269181]. 7. Almeida GA, Capelozza Filho L, Trindade Junior AS. Expansäo rápida da maxila: Estudo cefalométrico prospectivo. Ortodontia. 1999;32(1):45-56. 8. da Silva Filho OG, Boas MC, Capelozza Filho L. Rapid maxillary expansion in the primary and mixed dentitions: A cephalometric evaluation. Am J Orthod Dentofacial Orthop. 1991;100(2):171-9. doi: 10.1016/S0889-5406(05)81524-0. [PubMed: 1867168]. 9. Sarver DM, Johnston MW. Skeletal changes in vertical and anterior displacement of the maxilla with bonded rapid palatal expansion appliances. Am J Orthod Dentofacial Orthop. 1989;95(6):462-6. doi: 10.1016/0889-5406(89)90409-5. [PubMed: 2658544]. 10. Kau CH, Richmond S, Palomo JM, Hans MG. Three-dimensional cone beam computerized tomography in orthodontics. J Orthod. 2005;32(4):282-93. doi: 10.1179/146531205225021285. [PubMed: 16333050]. 11. Halazonetis DJ. From 2-dimensional cephalograms to 3-dimensional computed tomography scans. Am J Orthod Dentofacial Orthop. 2005;127(5):627-37. doi: 10.1016/j.ajodo.2005.01.004. [PubMed: 15877045]. 12. Farronato G, Giannini L, Galbiati G, Maspero C. Sagittal and vertical effects of rapid maxillary expansion in class I, II, and III occlusions. Angle Orthod. 2011;81(2):298-303. doi: 10.2319/050410-241.1. [PubMed: 21208083]. 13. De Rossi M, Stuani MBS, Silva LAB. Cephalometric evaluation of vertical and anteroposterior changes associated with the use of bonded rapid maxillary expansion appliance. Dental Press J Orthod. 2010;15(3):62-70. doi: 10.1590/s2176-94512010000300008. 14. Bramante FS, Almeida RR. Estudo cefalométrico em norma lateral das alterações dentoesqueléticas produzidas por três expansores: colado, tipo Haas e Hyrax. Rev Dent Press Ortodon Ortop Facial. 2002;7(3):19-41. doi: 10.11606/D.25.2000.tde-19032005-114805. 15. Claro CAA, Ursi W, Chagas RV, Almeida G. Alterações ortopédicas ântero-posteriores decorrentes da disjunção maxilar com expansor colado. Rev Dent Press Ortodon Ortop Maxilar. 2003;8(5):35-47. 16. Galon GM, Calçada F, Ursi W, Queiroz GV, Atta J, Almeida GA. Comparação cefalométrica entre os aparelhos de ERM bandado e colado com recobrimento oclusal. Rev Dent Press Ortodon Ortop Maxilar. 2003;8(3):49-59. 17. Schulz SO, McNamara JA Jr, Baccetti T, Franchi L. Treatment effects of bonded RME and vertical-pull chincup followed by fixed appliance in patients with increased vertical dimension. Am J Orthod Dentofacial Orthop. 2005;128(3):326-36. doi: 10.1016/j.ajodo.2004.03.039. [PubMed: 16168329]. 18. Baccetti T, Franchi L, Schulz SO, McNamara JA Jr. Treatment timing for an orthopedic approach to patients with increased vertical dimension. Am J Orthod Dentofacial Orthop. 2008;133(1):58-64. doi: 10.1016/j.ajodo.2006.01.048. [PubMed: 18174072].